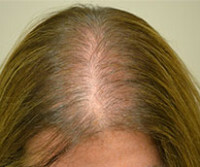 Archive by Category "Hair Loss Solutions"
Every client’s hair loss condition is different. Hair loss is a complex issue and there’s no ‘one size fits all’ fix, so in order to find the right solution it’s important to understand the cause in every case. This means an accurate diagnosis is necessary before any treatment can be recommended. Only by identifying and understanding the cause of the condition can you offer clients the best treatments and options. Trichology – the study of the scalp and hair – provides valuable knowledge into the many and varied causes of hair loss; what’s permanent, what’s temporary, what’s caused by extensions and weaves, what’s treatable, what’s better to leave alone and what could be the sign of an underlying issue needing further investigation by a health professional. Here at Banbury Postiche we train all of our salons in full consultation and offer a full support referral service if they are not sure. We have our own specialist hair lost consultant on site, who can be booked for a full one hour private consultation, just call on 01295 757410 to find out more. For anyone looking at providing hair loss advice, products and services, a course in trichology is a must. TrichoCare offers a range of bespoke remote learning courses that are designed to fit in with the busy lives of hair professionals and provide them with the specific and tailored knowledge they need. Banbury Postiche offer a full training course in how to set up a professional hair loss business covering everything from off the shelf acrylic wigs to full blown custom made real hair wigs. Don’t suffer hair loss alone or in silence reach out to Banbury Postiche to find out what is on offer and make a choice to deal with your hair loss, your way. Julie had suffered from a genetic hair condition for most of her life. The condition caused the hair to be sparse and brittle, with little or no length being achieved. Julie coped with this by having clever hair cuts and using lots of products and keeping to a set style. Poppy is an attractive 14 year old who has suffered from sudden onset of Alopecia. As we all know when you are a teenager your hair and appearance is very important, so losing your hair is a real problem and an easy target for bullies. Initially we looked at our hair integration volumiser for Poppy, however due to ongoing diagnosis and treatment we decided to look at our unique fringe, which we did and customised it to add hair at the back to look like a pony tail. Julie our senior hairdresser and Sue our seamstress pulled all of this together in under 2 hours and Poppy left with her head held high and an immediate resolution for her Alopecia Areata. Take a look at our very easy to wear and comfortable fringe, ideal for hot summer days when a full wig can be too hot or uncomfortable. Mrs R had tried many different hair loss solutions, including human hair wigs from China, when she came to the team at Banbury Postiche she was very disillusioned and felt that she would never get a real hair solution that felt comfortable and looked natural. After a private consultation with our Master Wig Maker and specialist wig hairdresser we agreed on the base, hair colour, length and density, 12 weeks wait for the knotting and making to be completed and today has been fantastic as Mrs R is over the moon with her new Custom Made Real Hair Wig. Made from a fine mono silk base with 100% hand prepared European Hair it was the best feeling to see her leave full of confidence and looking forward to ordering her next wig. If you are suffering from Alopecia toatalis hair loss then real hair custom made wig services from Banbury Postiche will have an ideal solution tailor made just for you. Using the very latest technology in wig bases, that are designed to work with Alopecia Totalis , combined with our hand matched European hair, your hair loss will be your secret.